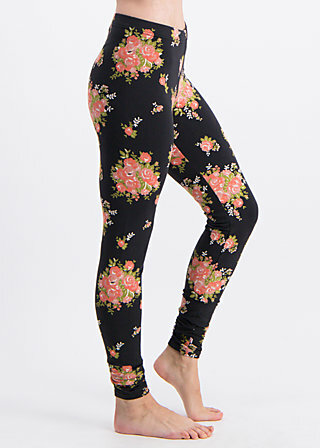 Comfortable pattern print leggings made of endlessly comfy cotton sweat, with a romantic-playful all-over print! These leggings are a textile feel-good wonder for the winter as the wonderfully soft sweat material has lots of great qualities. The figure-forming fabric is both solid and cosy, draws attention to your legs and warms them during the cold season. The elastane content ensures that you can move freely; the elastic waistband promises high wearing comfort – the perfect clothing article that goes with all your individual outfit creations. Choose between four colours and our all-time favourite, a once popular pattern we decided to bring back to life! A second life for leggings: the relatively heavy sweats are not just for underneath. I wear them as regular trousers, even as a quirky variation on skinny.